Welcome to Mountain Springs Ranch Property Owners Association website! We invite you to use this website to find community news and announcements and to locate information about our community. Realtors, please visit the Realtors Corner at the bottom right corner of this home page. At the March 25, 2019 Mountain Springs Ranch POA Board of Directors meeting the Board voted to partner with Diamond Association Management and Consulting (DAMC) of San Antonio effective April 1, 2018. Transition from Community Management Group will take place during the month of April. DAMC has assigned Arthur Bedford as Community Manager for Mountain Springs Ranch. You may contact Arthur at DAMC by email arthur@damc.tx or by calling 210-561-0606. The mailing address is 14603 Huebner Road, Bldg 40, San Antonio, TX 78230. The Mountain Springs Ranch Property Owners Associaiton Annual Meeting was held on March 30, 2019 at the Bulverde/Spring Branch Activity Center in Bulverde, Texas. At the meeting, Deena Clausen and Dwayne Scates were elected to the Association Board of Directors for two-year terms. Continuting Board members are Alan King, Keith Randolph and Mary Lu Zellers. The Board of Directors will hold an organization meeting on April 22 to elect officers and appoint committee liaisons. The Texas Department of Transportation (TxDOT) has been planning for improvements of SH 46 from Bulverde Road to FM3159/Smithson Valley Road, including widening to six lanes. The project is being planned in phases with construction anticipated to begin in late 2022. Citizen concerns and answers are posted on the TxDOT website at https://www.txdot.gov/inside-txdot/get-involved/about/hearings-meetings/san-antonio/072518.html. Outdoor burning in unincorporated Comal County is allowed after County Judge Sherman Krause lifted the burn ban on September 18, 2018. More information is available on the Fire Marshal Office webpage, mycomalcounty.com/Fire_Marshal.htm. Before any outdoor burning in Mountain Springs Ranch check the Fire Marshal's burn information. Spring and Summer hours (pool & playground) begin on April 1: 6:00 a.m. - 10:00 p.m.
Fall and Winter hours begin November 1: 7:00 a.m. - 7:00 p.m. Please be aware pools and playground may be closed for repairs or cleaning from time to time. The Sports Pool may be reserved by property owners for private parties but the main pool, kiddie pool, pavilion and playground are always open to property owners. All trails in the Nature Preserve are open to property owners and their guests from sunrise to sunset. No camping or fires are allowed in the Nature Preserve. Remember that from time to time, we will have equipment in the preserve, working on trails and mowing area along the trails.· For your safety, please stay away from equipment while it is being operated in the nature preserve. Mountain Springs Ranch neighbors have reported some close calls with vehicles on our roads. The posted speed limit is 30 mph on all Comal County roads AND roads in gated neighborhoods within Mountain Springs Ranch. Drivers: Please observe the 30 mph speed limit. Walkers and joggers, for your safety, please run/walk on the left side of the street where you are facing on-coming traffic. The Architectural Control Committee (ACC) meets the first Wednesday of each month. Expedite fees of $100 will apply to ALL applications that owners want to have reviewed outside of the regular monthly meeting. For more information, click on the ACC button at the top of this page or contact the ACC at msracc@msrpoa.com. The revised Architectural Site and Design Guidelines (ASDGs) have been filed with Comal County and are available on this website. Click here to view the revised ASDGs. ASDGs are being updated in 2019 and when revisions are complete the document will be submitted to the Association Board of Directors for approval. After approval the ASDGs will be filed with Comal County. MOUNTAIN SPRINGS RANCH VEHICLE IDENTIFICATION DECALS are encouraged for all property owners in Mountain Springs Ranch.· The small blue decals with a silver M on the rear window of vehicles idenitfy vehicles· belonging to property owners at Mountain Springs Ranch when those vehicles are parked at the pool, nature preserve or mailboxes. If you need a vehicle decal for your vehicle(s), contact the Association at mrspoa@msrpoa.com. May 9, 2019 - 6:00 p.m. - 8:00 p.m.
Reserve the Date - Details Soon! PROPERTY OWNERS: UNDER TEXAS LAW YOU ARE RESPONSIBLE TO KEEP YOUR ADDRESS INFORMATION UP-TO-DATE with MOUNTAIN SPRINGS RANCH PROPERTY OWNERS ASSOCIATION. To update email, address, phone number, etc. login to the Diamond Homeowner Portal on this website and update your information there. GATED NEIGHBORHOOD ACCESS: Realtors, when you list a home or property in a gated communities within Mountain Springs Ranch (The Hills, The Ridge, The Vistas), please ask the property owner to request a realtor gate code from Diamond Association Management & Consulting (DAMC) at 210-561-0606 or email arthur@damctx.com. Mountain Springs Ranch POA is managed by Diamond Association Management & Consulting in San Antonio, TX. Please send resale package requests to our DAMC Community Manager at arthur@damctx.com. For additional assistance or questions, you may call DAMC at 210-561-0606. The Property Owners Association must be notified of a property owner's mailing address and contact information in a sale or transfer transaction. Property Owners may update information by logging in to the DAMC Owner Portal on this website. Current MSRPOA governing documents are available for viewing or download from this website (mrspoa.com). RENTAL PROPERTIES: Property Owners and/or rental agents are responsible to notify the Property Owners Association of persons renting or leasing residences in Mountain Springs Ranch AND for providing the rentors with copies of the Association Governing Documents and Rules and Regulations which are posted on this website. All assessments are due January 1st of each calendar year. Budgets and Assessment Statements are mailed by December 1 to all property owners of record. Or you may login to your account by using the DAMC Owner Portal on this website. 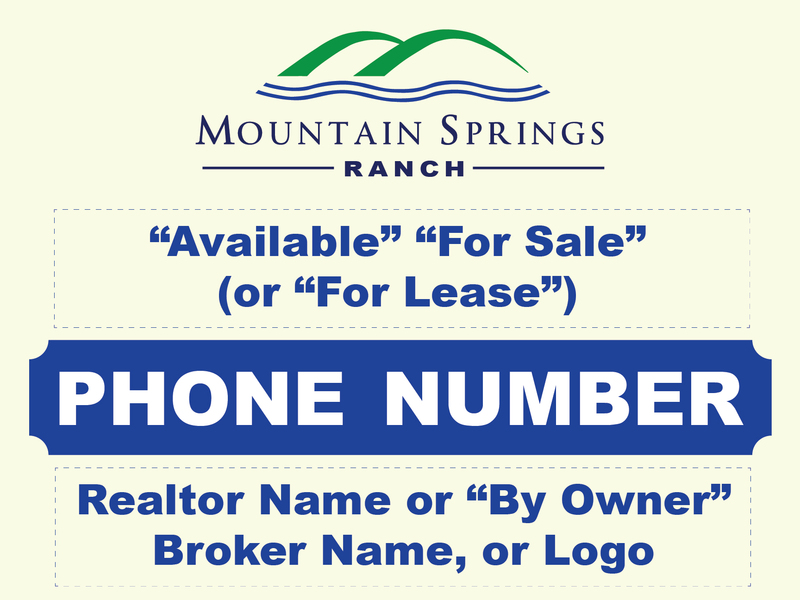 Realtors and property owners may post signs to advertise property for sale in Mountain Springs Ranch as long as the signs meet the Mountain Springs Ranch Sign Guidelines. Click here to review or download the Real Estate Sign Guidelines. Click here to download the Real Estate Sign Template. 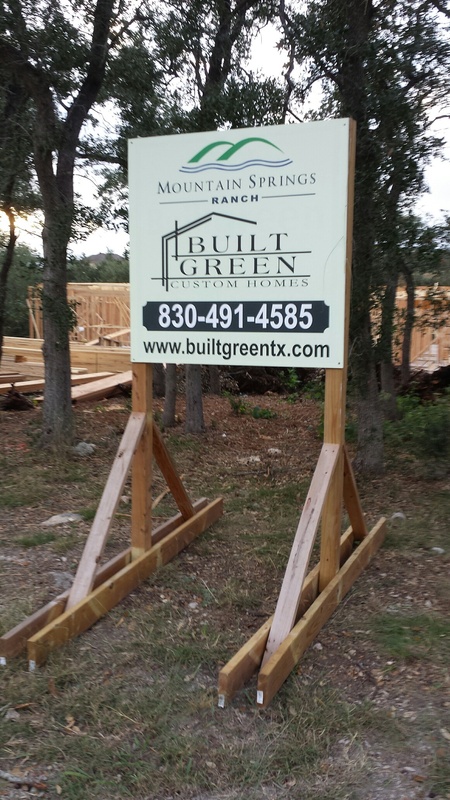 Any sign maker may be used as long as they adhere to our guidelines and use the MSR real estate sign template. 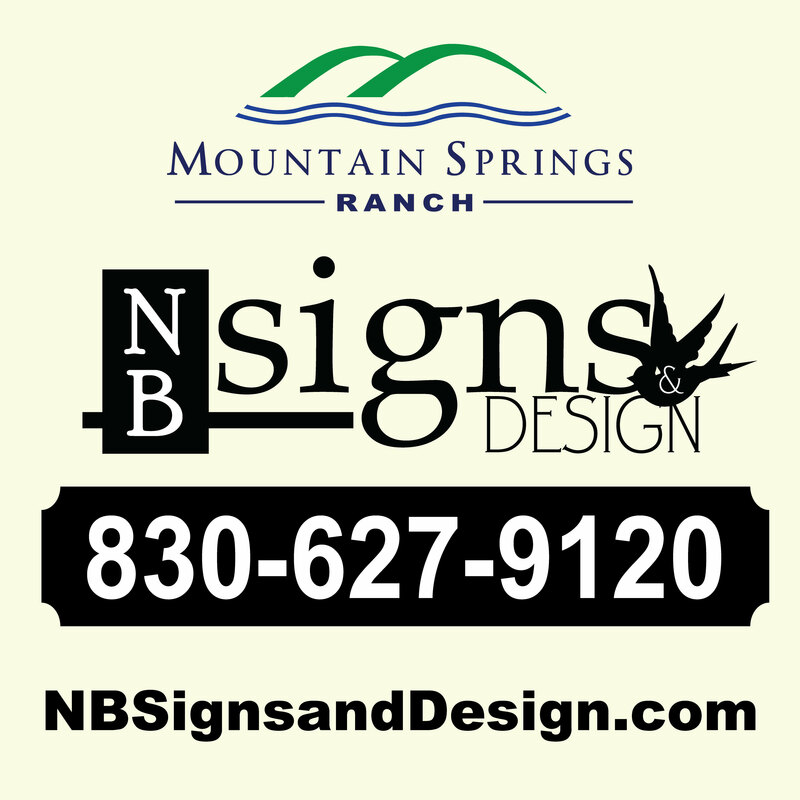 NB Signs & Design in New Braunfels has the approved template and logo.